The Flyers took back to back games from the Pens. It was an ugly thing to watch. There were disjointed line match-ups, major special teams failures and stupid penalties a plenty. No chemistry. Hockey, more than any other sport is a fast paced, change on the fly team effort. However, chemistry between line mates and defensive pairings matters. In the fall, the dependable chemistry of Kunitz, Crosby and Dupuis was undeniable. Dupuis brought speed and relentless checking while Kunitz brought great hockey vision and a fierce net-front presence. 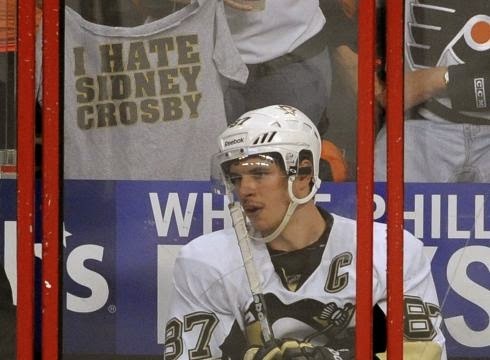 Still, the star of that line was always Crosby. Kunitz suffered thru all the jokes during the Olympics about riding Sid’s coat-tails and being nothing without Crosby but is it possible Sid needs Kunitz, too? In Saturday’s Flyers game, he registered 2 shots and finished -3. Sunday he had 3 shots and finished even. No goals, no assists all weekend. By contrast, over the two games against the Capitals last week, Crosby only registered 4 shots but had 2 goals, 2 assists and was a +3. What was the big difference? Kunitz played in the games against the Caps but not against the Flyers. Sure Kunitz plays better with Crosby but Crosby plays better with some chemistry. Crosby doesn't bear all the blame for the poor play over the weekend. During much of the season, the Pen’s Power Play could be counted on to get them out of the hole or nail the coffin shut. Sure, the Pens put A PP on the ice over the weekend but they didn’t put THE PP on the ice. There was no Martin, Letang, Kunitz (13 PP goals), or Neal (8 PP goals). The second PP unit was Engelland, Pyatt, Sutter, Maatta and Gibbons. As a consequence, they went 0 for 8 on the PP in the home and home series with the Flyers. Mostly, over the weekend, the team was unrecognizable. The Pens have played the whole season thus far with key players out of the game. This weekend the team eclipsed 400man-games lost to injury this season. That is a huge obstacle to overcome especially when you consider the caliber of player involved. If the Pens are going to stay at the top of the Metro and climb back to the top of the Eastern Conference, Sidney Crosby needs to get back to the puck shooting, goal scoring play that got him to the top of the points race. Arguably his worst NHL game ever was as recent as March 6th when he recorded one shot and finished -5. The next day against the Ducks, he still only registered one shot but did manage an assist. When you’re Sidney Crosby, you may have an off game. However, when your team is battered, bruised and broken you must (as you have before) grab them by the collar and drag them to the playoffs. It’s the price you pay for being this generation’s greatest hockey player. Absolutely nothing is wrong with him! Nothing is wrong with him. The guy isn't superman. Way too many injuries. That's all there is to it. Well when Sid is the only guy on the line as a threat to score (no Kunitz and Stempniak trying to learn the system) flyers simply double covered Sid. This is where Blysma needs to juggle lines more. Sid has had every winger on the team try out on his line sometimes even just one shift. There is more of a problem with Malkins petty penalties and the lack of scoring of the 3rd and 4th lines. Teams just key on 1 and 2 and little else.